Whispers in the Loggia: "The Greatest Who Made Himself Small... The Strongest Who Became Weak"
"The Greatest Who Made Himself Small... The Strongest Who Became Weak"
This period of the liturgical year highlights the two figures who played a prominent role in preparation for the historical coming of the Lord Jesus, the Virgin Mary and St. John the Baptist. 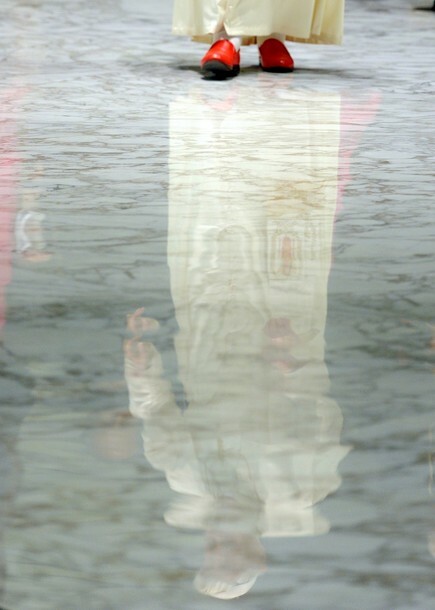 In fact today’s Gospel of Mark focuses on the figure of the Baptist. Indeed it describes the personality and mission of the Precursor of Christ (cf. Mk 1.2 to 8). Beginning with his outward appearance, John is presented as a very ascetic figure dressed in camel skin, he feeds on locusts and wild honey, found in the desert of Judea (cf. Mk 1.6). Jesus himself once held him in contrast to those who "wear fine clothing” in the “royal palaces " (Mt 11.8). The style of John the Baptist was meant to call all Christians to choose a sober lifestyle, especially in preparation for the feast of Christmas, when the Lord - as Saint Paul would say - "became poor although he was rich, so that by his poverty you might become rich"(2 Cor 8.9). With regard to the John’s mission, it was an extraordinary appeal to conversion: his baptism "is tied to a fiery invitation to a new way of thinking and acting, it is above all linked to the announcement of God's justice" (Jesus of Nazareth I, p. 34) and the imminent appearance of the Messiah, defined as "he who is mightier than I" and who will "baptize with the Holy Spirit" (Mk 1,7.8). Therefore, John’s appeal goes far beyond and deeper than a call to a sober lifestyle: it is a call for inner change, starting with the recognition and confession of our sins. As we prepare for Christmas, it is important that we find time for self contemplation and carry out an honest assessment of our lives. May we be enlightened by a ray of the light that comes from Bethlehem, the light of He who is "the Greatest" and made himself small, he who is "the Strongest" but became weak. All four Evangelists describe the preaching of John the Baptist referring to a passage from the prophet Isaiah: " A voice proclaims:In the wilderness prepare the way of the Lord! Make straight in the wasteland a highway for our God'"(Isaiah 40.3 ). Mark also adds a quote from another prophet, Malachi, who says: " Now I am sending my messenger— he will prepare the way before me " (Mk 1.2, see Mal 3.1). These references to the Old Testament Scriptures "speak of the saving intervention of God, coming out of his inscrutability to judge and save, we must open the door to Him, preparing the way" (Jesus of Nazareth, I, p. 35). To the maternal intercession of Mary, the Virgin who awaits, we entrust our journey towards the Lord who comes, as we continue our journey of Advent to prepare our hearts and our lives for the coming of Emmanuel, God-with-us. As the Vatican wends its way through the season, this week brings one traditional December ritual of the Popes... and a new one that's anything but. 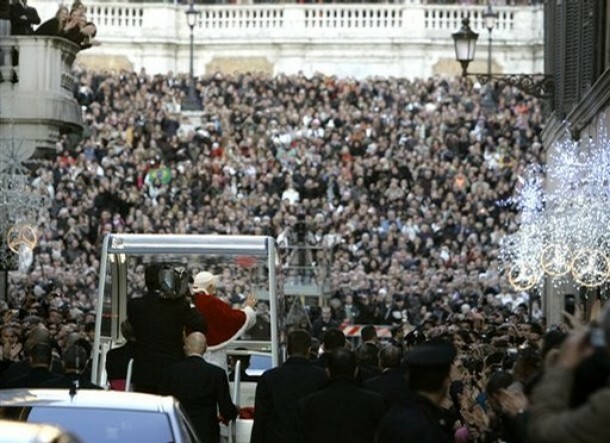 On Thursday's solemnity of the Immaculate Conception, Benedict XVI will travel to Rome's Piazza di Spagna (above) for the customary late afternoon wreath-laying and prayer at the foot of the statue dedicated to the Madonna under said title at the center of the square. Over the years, the ceremony -- known in Italian as the Omaggio all'Immacolata -- has come to double as the unofficial opening of the city's Christmas celebrations, somewhat akin to the arrival of Santa Claus at the close of Thanksgiving parades in the States (and not just because the reigning Pope's taken to donning the Santaesque ermine mozzetta for the day, either). The night before, however, will see the first instance of a decidedly modern Yuletide kickoff, as the pontiff turns on what's become known as the world's "Biggest Christmas Tree" -- a 2,000 foot high light-form splayed on an Umbrian hillside -- with a tap of an iPad. Of course, the lighting of the Gubbio tree will be Benedict's second public turn at an Apple tablet in the last six months -- in his first ever appearance with a computer, the Pope used an iPad to launch the Vatican's News.va portal in late June (above), at which time he likewise sent an unprecedented tweet. While the pontiff's Advent calendar is still full with special events -- including a mid-month visit to a Roman prison -- in another sign of the gradual curtailing of his schedule as he prepares to turn 85 in April, for the first time since his 2005 election, Benedict did not celebrate a public Vespers in St Peter's Basilica on the Vigil of the First Sunday of Advent to mark the start of the new liturgical year. Likewise, continuing a concession to his reduced stamina first introduced in 2009, B16's "Midnight" Mass of the Nativity of the Lord will yet again begin at 10pm Rome time on Christmas Eve. 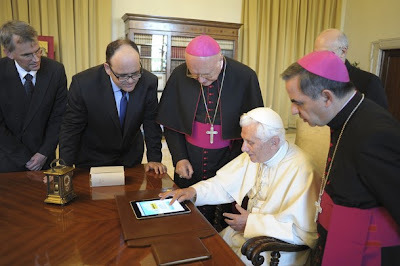 SVILUPPO: According to a Vatican brief released on 6 December, the Pope won't return to using an iPad for the Gubbio "tree"-lighting, but a Sony tablet running Google's Android mobile operating system.